I don’t do a lot of insect photography, mainly because they move quickly and I move slowly, but this dragonfly kindly stayed around for me to shoot for almost 5 minutes, around 6:15 p.m. a little over a week ago. 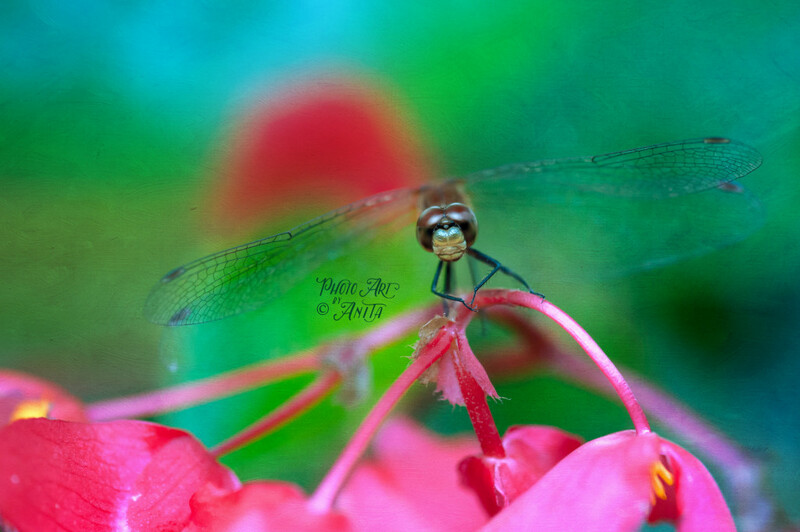 He was perched on the lovely begonia plant in our backyard, giving me a lovely backdrop for his portrait. There wasn’t much light in that part of the yard, so even with ISO 2000 I had to shoot at f / 5.0. Not surprisingly, I didn’t get much in focus, but at least in this shot his eyes are pretty sharp. Not as sharp as I would like, of course, but I’m happy to have gotten at least one decent shot. Since Casablanca is one of our favorite movies (we saw it on our first date back in 1972 at the Harvard Square Theater) I couldn’t resist using this quote for my title. Processed in with basic adjustments and with Brushed Rose from Flypaper Textures, using Adobe Paper Textures. Wow, isn’t he a beauty, your work always amazes me! This is an amazing photo with all the detail you have captured . . even the wings. Love your back story as well. Thank you so much for your lovely comments, Carolyn! I was so lucky that he “posed” for me! Thank you so much for your kind comments, Ann! My Favorite Photos from 2017!